According to a fresh report coming from Samsung's home market of South Korea, local market analysts expect Samsung to report a very strong operating profit for the second quarter of 2016. Quoting a report from South Korea's Shinhan Investment, Korea Times says that Samsung's operating profit for the quarter is expected to rise above the 7 trillion won mark. Among the main drivers behind this growth, the report highlights a strong commercial success for the Samsung Galaxy S7 series as well as a growing demand for flash memory chips. Most of this profit (about half) is expected to come from Samsung's mobile business, which is estimated to reap 3.6 trillion won in profit for the April-June quarter. If the figure turns out to be accurate, it would be good for 12.4% YoY growth. As we've heard since a few weeks ago, Samsung's Galaxy S7 and Galaxy S7 edge are performing above market expectations in terms of sales. According to Shinhan Investment analysts, Samsung is expected to sell about 14 million Galaxy S7 units by the end of the quarter, a figure that would be good for a 40% improvement compared to the previous quarter. However, although the Galaxy S7 is selling better than expected, the profit coming from Samsung's mobile division is also expected to be boosted by Samsung's higher profit margins on lower-end devices such as those from the Galaxy A and Galaxy J series. The report claims that five other brokerage firms now expect Samsung to draw in more than 7 trillion won in operating profit. If this estimate turns out to be accurate, this would be the first time in nine months that Samsung's profits rise above the 7 trillion won mark. Aside from Samsung's mobile division, the flash memory business is also expected to boost Samsung's overall profit. Samsung's device solutions unit, which is mostly responsible for the memory chip business, is expected to report 2.6 trillion won in operating profits for the second quarter of the year. 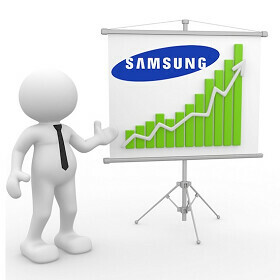 Samsung's display division is also expected to report a minor but existing profit for the April-June quarter. I don't think the numbers are as good as they say. You mean you fervently hope they aren't. You seemingly go out of your way to hope for negativity when it comes to anything dealing with android. You have made it clear you intensely dislike Google and to an extent Samsung for whatever reason, so it is laughable for you to turn around and expect anyone to think what you say is coming completely without maliciousness or bias. Just own the fact that you dislike those companies instead of pretending as if you are ambivalent to them and have purely objective reasoning behind your statements. It's driven by his pain over their success. I have a Moto X Pure Edition. That pretty much invalidates a good bit of your comment. I do have my reasons just like the ones who trash Apple on a daily basis. You claim to. But even if you did, it wouldn't change your motivation. that doesn't invalidate his comment. Anyone can tell you that they own every flagship phones from major oems..and with your logic these people won't dislike any phones, os or oems. He sounds like the guy who claims he isn't racist because he has one black friend. What did I deny? In fact, you're the one who denied something in your original statement, which makes you the one in denial. Just another scumbag Apple cheerleader. It's a damn good phone! It could have been a good phone. It could have an Apple logo on the back, then it would be the bestest phone ever. It could have been better, of course. Anything can. But as it stands, it's the best in the non phablet category. 14 million in one quarter?? So it can reach 56 million in one year, but Samsung is selling more than 300 million phone each year so... is it really a successful business?? It goes to show you that the majority of the 300 million sales are midrange and low end phones. The Note will add to the 56 million, but still very low compared to iPhone. When it comes to flagships, Apple is selling more in a quarter that what these guys are selling in a year even if you didn't include the older models. The thing is, this isn't a one-to-one model. Because we have never seen Apple produce a lower-range phone, in which case a huge chunk their sales would likely shift for the cheaper model. And no, I'm not counting the SE for the simple fact that it is a niche product with a much older design. That isn't really a test of Apple's ability to retain high-end sales. Apple can exist on its own and has a bit of a buffer against direct competition because there is literally no-one else making devices on the iOS platform. The same isn't true for Samsung. Whenever comparing iOS and android or Apple and Samsung, remember that. The problem is Apples phones are not really flagship phones, they have mid-range specs at best. Add in all the mid-range Samsung phones that have specs that match and better the iPhone and you see why Samsung sell more smartphones than Apple over and above the lower-end that Apple does not compete in. Android sells over a billion smartphones every year now. As a matter of fact Android should sell around 1.2 billion smartphones this year. Even if Android in total has only 20% of its devices sold as flagships, then that will work out to 240 million Android flagship devices. You guys are forgetting that Android has the numbers. Apple has less than 15% global market share. HAHAHAHAHA, this is such a misleading article PA!! Here's why: first, we are talking about billions here and not trillions in profit. The writer did not take into account that these numbers are based on the South Korean currency (the Won) and not in US dollars. Second, the writer did not even take the time to compare these number to USD. The Korean Won is convertible at approximately only USD/KRW 0.000840, hence all that 7 trillion which seems so impressive is actually only at around 5.89 billion. And now with this number we can see that it's actually not such a massive number as this article has mislead people to think. I have encounter numerous people in the past thinking that Samsung makes a much, much higher number of profit versus Apple (In reality Samsung does even come close to Apple's profits) simply because they read articles such as this one which does not even bother mentioning the equivalent amount in USD. Oh my god, you're right! Only $6 billion profit in a quarter? How ever will Samsung survive?! I was only pointing out the fact that their Quarter isn't not as impressive as some think. Six billion is nice but I was hopping to see Samsung do much better with their GS7 hence the way I see it that 6 billion and those 16 to 20 million units sold it's not impressive even thought they did some progress.